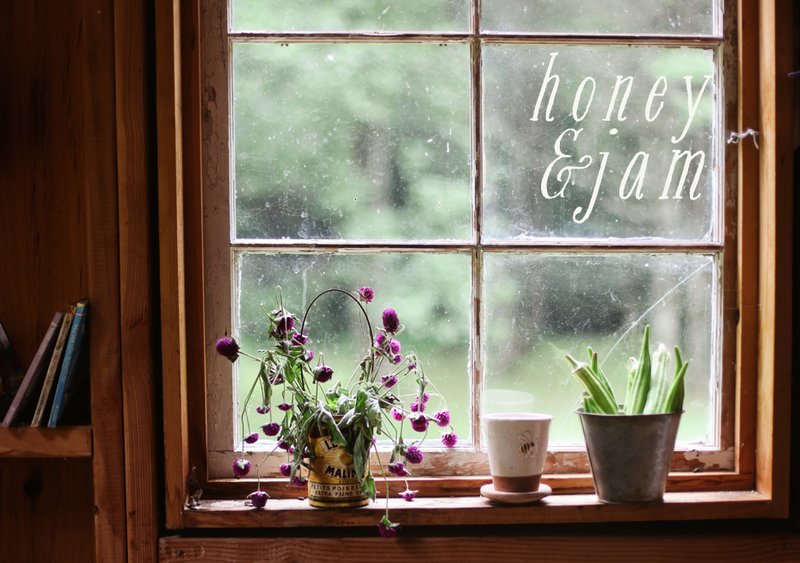 honey & jam | recipes + photos: Even more chocolate chip cookies! Plus a giveaway! Even more chocolate chip cookies! Plus a giveaway! The other day, I decided to try and find the perfect chocolate chip cookies. I know I just posted some last month, but I figured I could find a recipe better than my favorite. I started out ambitiously, printing out 5 recipes to try. The first recipe was a Martha Stewart one, which I just didn’t care for at all. It was just sort of bland, I didn’t even take pictures of them! 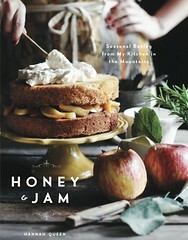 The second was a recipe from Alice of Savory Sweet Life. I’m sort of in love with it. They grow on you, getting better as they cool. They are crisp, and the perfect mix of salty and sweet, I absolutely loved the sea salt in them. The first batch I made I used my small cookie scoop, the second I used my big 3 tablespoon scoop, and they were even better, more textured, crisp on the edges and softer in the center. So make them big! The third was from Ashley of Not Without Salt. 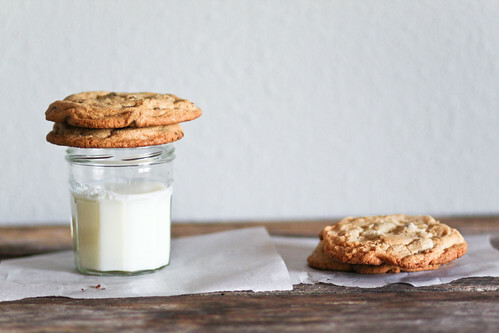 They are your quintessential chocolate chip cookies. The texture is exactly what you expect, but with an added crunch from the turbinado sugar, and they are delicious. It’s an excellent cookie. I wish I could have used chocolate chunks, like Ashley recommends, but sadly I only had chips. I bet they would have been even better! After that one, my quest for perfection was waning a bit, so the last 2 recipes will have to wait a while. Both of these recipes are so, so good, and it’s really hard to pick a favorite. You should really make both, as they are quite different, but equally good, and much better than my former favorite. I’m making them again tomorrow to send off in the mail, I hope the recipient enjoys! To encourage you to make some for yourself, today I’m giving away the Oxo 3T Cookie Scoop. It makes big, uniform sized balls of dough so all of your cookies cook perfectly and at the same speed. I love it! Enter once by leaving a comment on this post telling me what your favorite kind of cookie is and a way to contact you if you don't have a blog. No entries after 10 pm EST this Thursday, December 10th. I’ll select one winner through random.org Friday. 1 tsp. smallish-medium coarse sea salt *please do not use table salt, the sea salt gives the cookies a nice flavor and hints of texture. If you must use table salt, use 1/2 tsp. Preheat oven to 360 degrees. Cream butter, sugar, and brown sugar until it is nice and fluffy (approx. 5 minutes on medium speed on a K-5). Add both eggs and vanilla and beat for an additional 2 minutes. Add baking soda, baking powder, salt, and flour until cookie batter is fully incorporated. Finally add chocolate chips until well distributed. The cookie batter should be somewhat thick. Drop about 2 tablespoons of dough or use a medium cookie scoop and plop the batter onto a baking sheet lined with parchment paper. Bake for 12-14 minutes until the edges are nice and golden brown. Remove from heat and allow the cookies to stay on the cookie sheet for an additional 2 minutes. 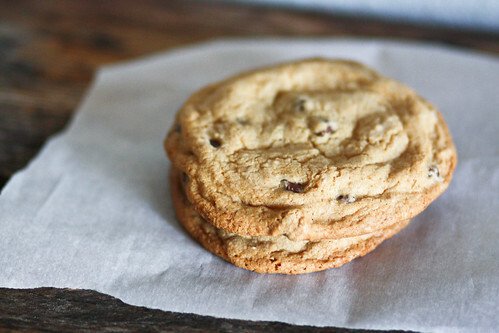 Pick up the parchment paper with the cookies still on top and transfer to a cool non-porous surface. Allow the cookies to cool on the paper for at least 3 minutes before serving. Enjoy! Cream the butter and the sugars until light. Scrape down the side of the bowl. Continue mixing while adding the eggs one at time. Make sure each egg is incorporated before adding the next. Add the vanilla. Scrape down the bowl with a spatula. Combine the flour, soda and salt in another bowl. With a whisk, stir to combine. With the machine on low, slowly add the flour. Mix until just combined, taking care not to over mix. With a spatula fold in the chocolate. If you so choose, and I do recommend that you do, sprinkle a very fine dusting of good quality sea salt. Fleur de Sel or Murray River Pink Salt are my recommendations. Those look delicious. I have to say paula deen makes a really good loaded oatmeal cookie that I crave every christmas. my grandmothers' soft gingerbread cookies are the best ever. My favorite cookie is a toss up between chocolate chip cookies(have to have crunchy edges) and NFSC(No fail sugar cookies). My favorite kind of cookie is gingerbread. Have you tried the NY Times recipe? What did you think of it if you did? I never knew cookies could look so appetizing. Your photography is inspiring as always. Favorite cookie for me is probably chocolate chip or macadamia nuts! My favorite cookie? That's a toughie. I made the most amazing pumpkin butterscotch chip cookies for Halloween, but I really have a weakness for anything mexican wedding cookie-like. I've seen a ton of variations, but any small buttery crumbly cookie covered in powdered sugar is yummy. love your website, you are very talented. My favorite cookie is Dorie's World Peace Cookie. So much chocolaty goodness! these look heavenly. my new favorite cookies are lemon poppyseed. we make a big batch and freeze a few dozen. delicious! We really like Chocolate Chip cookies with yeast......warm! These look scrumptious. I love your photos. My favorite cookie is Molly Wizenberg's oatmeal chocolate chip cookies, they're perfect. Oh yum and what a fun post. My favorite is chocolate chip, the New York Times recipe. I love the crunchy edges and soft centers. And twittered it too. 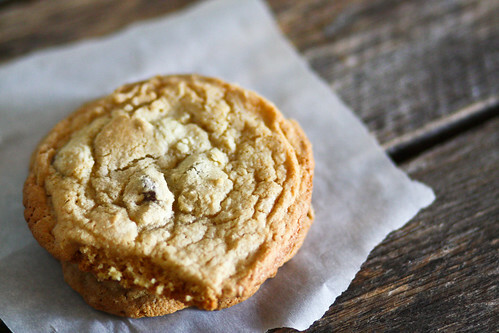 Second fave would be peanut butter chocolate chunk cookies. I loooove chocolate chip and peanut butter cookies so much!! My favorite are my mom's chocolate chip, coconut and oatmeal! I really want these, they have such a reputation ;) My favorite cookie would have to be oatmeal chocolate chip with gingersnap being a close second. Both with ice cream of course. I love my dad's molasses cookies. And my mom's snicker doodles. And anything with shortbread. Clearly I like cookies. I love snickerdoodles! Thanks for the giveaway! Oh wow...I'm going to need to try all of these! My current fav is a Snickers cookie. Peanut butter dough shaped around a mini Snickers and then baked. Oh. My. Goodness...they are fab! my fav cookie is currently these amazing butter sandwich cookies from a gourmet market near my parents. yum! Anything with oatmeal: butterscotch, chocolate chip, raisin, so good! I have been wanting a cookie scoop for awhile! My favorite cookie is chocolate chip, hands down! I've been looking for the perfect chocolate chip cookie recipe, so I"ll have to give these a try. I love so many cookie recipes, it's hard to choose a favorite! Chocolate-caramel thumbprints from BH&G's Ultimate Cookie Book. It is officially the cookie I measure all other cookies against. My favorite kind of cookies is a chocolate chip and raisin oatmeal cookie. Especially with a hot chai. Ohhh man. Does a brownie count? I really like my mom's mint chocolate brownies... they are easy to make, beautiful to serve and freeze really well too! Perfect! If my mom is making the cookies, my favorite is chocolate chip. If I'm making them, it's oatmeal chocolate chip. My dad never cooks, but once in a blue moon he makes the best oatmeal molasses cookies ever! Hi. I just love your blog. It makes me crazy hungry for baked goods. My favorite cookies are danish butter cookies. Butter, sugar, flour, sugar. They melt in your mouth. I pretty much love anything with a lot of butter. I am going to do a link to your blog on one of mine. I'll put another note here when I do. Wow! Look at all these comments! My favorite chocolate chip cookie recipe is your basic Toll House, but I do a couple of things differently. First, I use Ghiardelli chips. Second, I let them sit in the fridge for a couple of days before baking. I heard this tip on The Splendid Table last year and it was a good one; the cookies lose some of their liquid in the refrigeration process so they aren't as flat, plus it adds to that penuche flavor. Delish. I'm also a big fan of Toll House Pie. Ever made it? Posted it on my blog, Hannah. I love seeing all the comments here on your post! i love oatmeal choc chip cookies! Those cookies look delicious! My (current) favorite cookie would have to be what I call the Friendship Cookie: chocolate on the outside, peanut butter on the inside. The reason behind their name is that they're really great to make with friends (the process is faster and much more fun), and the chocolate and PB go so well together. Oatmeal sandwich cookies....two oatmeal cookies with yummy cream filling! I'd love to be entered for your giveaway. Thx! I would have to say chocolate chip cookies. Biscotti is awfully good as well. I happily posted about your giveaway on my blog: mixedbabygreens.blogspot.com. Thanks honey & Jam! Fun! My favorite to make are chocolate chip oatmeal coconut, for the childhood memories :) But my favorite to eat are Molasses Spice! The secret? A little fresh ground black pepper for bite. Yum! I'm a pureist and my favorite is chocolate chip. No nuts, no oatmeal, just good ol' butter, flour, sugar & chocolate please! I love oatmeal chocolate chip cookies (with walnuts & coconut). It's a flavour explosion. I'd love this scoop! My favorite cookie is a yummy gingerbread-spice cookie. Something that makes you feel warm when you bite into it. shortbread thumbprint rounds filled with raspberry jam. my blog is http://ilovepotsandpants.wordpress.com please send some love this way! and i am definitely gonna try your recipe today! Oatmeal Raisin Cookies from the top of the Quaker Oatmeal container! 7 layer cookie bars - do those count? Wow. . .picking a favorite cookie is really hard, so I guess I'll pick my favorite Christmas cookie, since it is that time of year, and that would be a Springerle. It's a German cookie (my dad's side of the family is German) and the dough is a powdered sugar/egg based cookie (with lots of flour, too!) with anise flavoring, and you roll out the dough, press it with a carved wooden board, let the cookies sit for 24 hours and then bake them. The design really pops out. They are amazing. Your blog is so beautiful. Salty peanut cookies are my favorite cookie. Salty and sweet... So good! My favorite cookie is an oatmeal, peanut butter, chocolate chip cookie that I make. It's my favorite because it has just the right amount of sweet to it! German lebkuchen -- not too sweet, perfectly spiced, and that light icing on top. perfect! Are you kidding me? Chocolate Chip Cookies of course. My favorite type of cookie would be the oatmeal raisin cookie. I don't know why I haven't posted about my favorite recipe for them yet. My favorite is a tie between choc chip & iced sugar. Hey Hannah! I love a soft chocolate chip cookie! With loooots of choc chips in it!! I've been wondering wich recipe to try from the 3 u've tried! Ohh! I also love Gingerbread cookies! I'm a sucker for spices! U know wot i love more than cookies?? Ur photograpghs! Ur extremely talented girl! You made THREE batches? I'm not crazy about baking cookies but do enjoy eating them. I'd have to say PB cookies with mini baking reeses cups but I MUST have a large icy cold glass of milk with them. ahhh!!! i want this so bad!!! 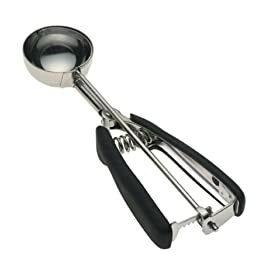 every time i make cookies i say to myself, "this would be so much easier with a cookie scoop!" My favorite cookie is definitely the chocolate chip cookie. i think i have an obsession. I love classic chocolate chip cookies! my favorite cookies are these drop cookies i make with dried cherries and a mixture of milk and white chocolate chips...they are so good, and im not the biggest fan of white chocolate!!! Christmas is the only time of year my mom makes the chocolate/peppermint cookies that are rolled in powdered sugar. SO good! i love chocolate chips, especially with milk, but i could eat thumbprint cookies with raspberry or apricot jam for DAYS. My local coffee shop makes an awesome chocolate mint cookie! http://ilovepotsandpants.wordpress.com/2009/12/08/when-depressed-bake/ - I blogged about it! Please let me win :) I love white chocolate macadamia nut cookies! I don't (yet!) have a perfect recipe for them, but I love the combination of dried cranberries and white chocolate in a cookie... it's gotta be a nice, hefty oatmeal cookie too, I think. Siiigh. My favorite kind of cookie is probably a chocolate chip one. Since it's cookie baking season though, and I've been baking Christmas cookies like crazy, I'd have to say that my favorite Christmas cookie is the Bird Nest. This is a basic cookie rolled in chopped walnuts and filled with strawberry jam. I don't know where the recipe came from...it's been in my family for a long time...but it's so good and everyone loves them! Thanks for offering that awesome cookie scoop-I LOVE big cookies! Hands down, it is peanut butter and jely sandwich cookies!!! Hmm a classic chocolate chip cookie made with Guittard semisweet chips or anything loaded with toffee. Man I love toffee! Drool...all your treats look fabulous! My favorite cookie is chocolate chip followed by Dutch chocolate, snicker-doodle and crescent. Milk is a must too. Always looking for more chocolate chip cookie recipes for the firefighters - much more creative than that, and they won't eat them. My favorite cookie is a dark chocolate-covered ginger orange florentine. I make them once a year for Christmas. I'd have to go with the standard tollhouse chocolate chip cookie. lemon shortbread. really anything lemon, but shortbread with lemon is the most delicious cookie in my book. My favorite cookies are SNICKERDOODLES!! Simple, sweet, perfect. To date, one of the best recipes i've tried were the Apple and Carrot Shortbread cookies posted on the 101 Cookbooks site. Soooo yummy. I love making choco chip cookies just so I can eat the dough! But my favorite to make is peanut butter cookies using 4 ingredients: p.b, sugar,egg, vanilla. These are the softest, chewiest p.b. cookies you'll ever eat. Plus, their easy! My fave is old-school - oatmeal chocolate chip. I've never used a cookie scoop before; I bet it makes things go way faster! Chocolate chip cookies definitely win. If done right, they are hands down the best cookies ever. I even eat the dough balls raw sometimes! My favorite cookie really depends on the given moment. Lately, I like the gingersnap strips that I make as soon as the weather grows cooler. I LOVE cowboy cookies! Especially the coconut! gingerbread or spice cookies, hands down! I am not a big cookie fan, though these both sound delightful. My favorite type of cookie is anything with a little kick to it - molasses with cracked black pepper, extra gingery gingerbread, those sorts of things. I love your blog! i'll only make my grandmother's recipe for cowboy cookies. YUM! happy holiday's! I've been tweaking my recipe for the past two years, and every time I make a batch in my dorm people swarm the kitchen to eat and be happy. Best reason to make cookies ever. My favorite cookies are peanut butter. I adore a good, soft, melty chocolate chip, but will grab a good peanut butter first every time. How can you not love a good chocolate chip cookie. Fantastic! My favorite cookie is the classic oatmeal raisin. No matter how many exotic cookies I come across, I always come back to this traditional favorite. Yum! Your cookies look so beautiful. Love all of the great pics! My favorite cookies are oatmeal cranberry... or maybe gingerbread (at least during the holidays). But, there's something to be said for a great chocolate chip cookie recipe, too! Any cookie with chocolate but my ultimate favorite is a chocolate dried cherry cookie. My favorite cookie has to be peanut butter oatmeal chocolate chip. Yum. yum! love choc chip, but right now, french macaroons..vanilla ones..are my fav. favorite cookie?? chocolate chip for sure! My favorite cookies are my Aunt Marilyn's super-delicate sugar cookies. The fall apart and melt in your mouth! I blogged about this but I was already blogging about giveaways and added you...does that count??? My favorite cookies are either Peanut Butter Chocolate Chip or Milk Chocolate Chip Oatmeal. Both are seriously delish! My favorite kind of cookie at the moment is a chocolate chip banana oatmeal recipe that I actually got from the Lisa Frank website (oh, the shame!) and then adapted to be gluten free. The texture is amazing, and the flavor is mildly Christmassy and perfect because it uses cinnamon and cloves. I loooove chocolate chip cookies. I have a recipe that a friend gave me. I altered it after watching Alton Brown's chocolate chip cookie special. I love chewy cookies and Alton does a great job of explaining how to get cookies that end up that way. I used the altered recipe this summer to bake 1,000 cookies in one week for an event at my church. Oatmeal butterscotch. SIGH - heavenly. I love white chocolate macadamia nut cookies. Yummmmooo. mmm, shortbread cookies are my fave! I think my favorite is nanimo bars! It's so hard to choose, but I think peanut butter chocolate chip cookies that have tons of peanut butter in there! Love your blog, and Jesus too :) Thanks! i apologize if this is the second time this posted. i only intended to send it once, but i rarely make comments, so i'm not really sure what i'm doing. my favorite cookies are the oatmeal chocolate chip cookies that my mom used to make really frequently, for every occasion and just because. my other favorite which i must eat at christmastime and love for its chocolatelyness is chocolate snowflake cookies. if you want to bake them, i'll post the recipe. yo-yos with passionfruit filling, just divine! Now that's a cookie that is crying out for a scoop! Chocolate chocolate chip - there's never too much chocolate. Peanut butter... I love chocolate more than words can say, but for some reason, a soft, melt-in-your-mouth peanut butter cookie is tops with me! I made cookies the other night with peanut butter chips... delicious... especially for breakfast! I've been looking for a new cc recipe. I'll try these. My favorite cookie is a white chocolate/craisin cookie! My favorite cookie is chewy Chocolate chip cookies. Your pictures are delicious! Chocolate Chip are my favourite everyday cookie, and my favourite Christmas cookie has to be my mom's Pfefferneusse. I was just telling mom the other day how I would like a cookie scoop. :-)It was sort of a Christmas gift hint, haha. There's a bakery in the Texas Hill Country that makes the best iced molasses cookies. They are so soft and almost like cake! My grandmother's gingersnaps. So good. And could be made with an oxo scoop! YUM. I love cookies. My favorite kind of a cookie is a tie between salted nut bars and cranberry cookies my mom makes. At the moment, my favourite cookies are Gingerbread Men. I baked some to give as gifts today, but I think I might eat them all before it comes time to send them, haha. This recipe looks great..and a crucial mix of that sweet and salty. My favourite are those Christmas cookies from Germany that are made of a divine mixture (that I've yet to work out) of almonds, plenty of dark chocolate and vanilla. Love original nestle toll house choc. chip cookie with pecans. Yummy. It's incredible just how words and pictures can make one want something? 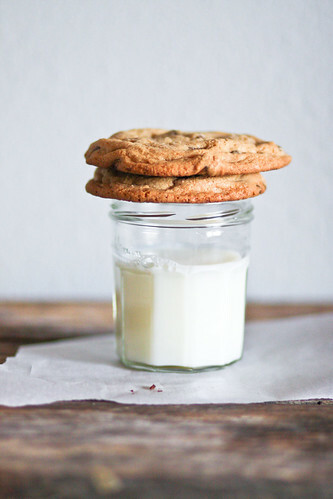 I so badly want milk and cookies right now. Nice post! Thanks for sharing! and I really enjoy reading your post. Just found your blog! 7 months pregnant and now that I've found you, I'm really hungry! I once had lemon cornmeal cookies but chocolate chip may be my fave! I have yet to really conquer a great recipe! Can't wait to try yours out!